environmental justice; equal pay; eradicating violence against women; gender parity in elected office; LGBTQIA, immigrant, and disability rights; passage of the proposed ERA; and, reproductive rights/self-sovereignty. Trinity Lane @ Fall St.
For frequent updates please visit our Facebook Event Page. If you would like to help us create the best day possible for us all, please consider making a contribution to our 19 Campaign. and accountability in our actions. nor possess (or consume) any alcohol or drugs. 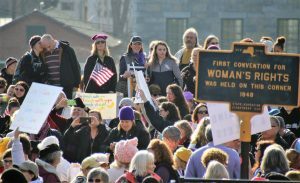 We are non-partisan, and use the Women March in Seneca Falls primarily to express our support for women’s rights and human rights in our communities and the country, rather than to criticize politicians or political parties. We will all hold each other accountable to respect these agreements.